The game of shinty is older than Scotland's written history: it predates Christianity, having been introduced to the country by migrant Gaels from Ireland, who had been playing a similar stick and ball game called hurling since before the common era. Cammag, a Manx team sport related to both hurling and shinty, used to be the most popular game on the Isle of Man before soccer was introduced in the twentieth century. The name "cammag" is a cognate of camanachd, the Scottish Gaelic word for shinty. Cam is a Gaelic root meaning "bent," and describes the hooked stick that players use. These stick-and-ball games were traditionally played during the winter months. On New Year's Day, whole villages would gather to participate in huge shinty matches, with each team featuring hundreds of players. The modern sport of shinty is governed by the Camanachd Association, which was established in Kingussie in 1893 to formulate a standard set of rules to unite the many shinty clubs scattered across the British Isles. 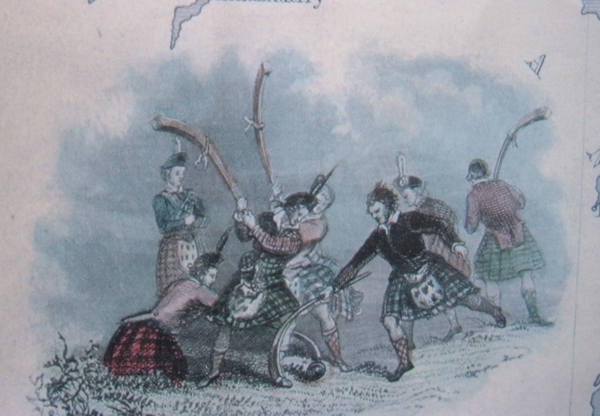 The Inverness-based Camanachd Association, retained its initial structure for much of the twentieth century until the management and organization of the sport was completely restructured in 1981. The Association, which had previously depended on volunteers to govern the sport, employed its first salaried workers that year. While shinty is often compared to field hockey, the two sports have many important differences. 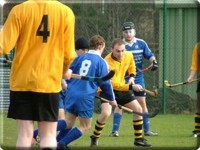 For instance, a shinty player is allowed to play the ball in the air and is allowed to use both sides of the stick. The stick may also be used to block and to tackle, although a player may not come down on an opponent's stick, and a player may tackle shoulder-to-shoulder using the body. The objective of modern shinty is to play a small ball into a goal at the end of a field. The ball is played using the caman, a hooked, wooden stick that, unlike in hurling, must not have any plate or piece of metal attached. Two teams consisting of twelve players, plus one goal keeper, play two halves, each lasting 45 minutes. With the exception of the keeper, no player is allowed to touch the ball with his hands. 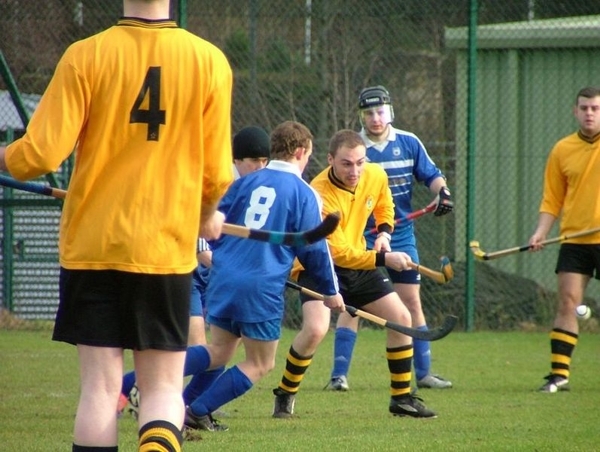 While shinty was once spread throughout the British Isles, today it is almost exclusively restricted to the Highlands (although shinty clubs also exist in Scotland's larger cities). Despite its regional flavour, shinty was one predecessor of a culturally-critical Canadian innovation: ice hockey. 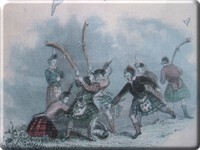 Scottish immigrants adapted shinty to the icy conditions of the New World. Students at King's College School in Windsor, Nova Scotia, for example, played "shinny" (a common term for one of shinty's many regional variations in Scotland) on the pond at the turn of the nineteenth century. To this day, shinny remains the Canadian term for an informal game of hockey.